It's officially summer and Children's Hope kids are taking full advantage, learning great skills, enjoying the warm weather and fun activities! Two kids were caught by camera, mid-fun, in their local papers. Acer Bowman-Tomlinson and his sister Calli, adopted from China's Waiting Child Program, are both extremely busy this summer. "In fact," says their mom Heather, "Friday, Dad and Acer are going to be filmed for a segment of PBS Sprouts!" 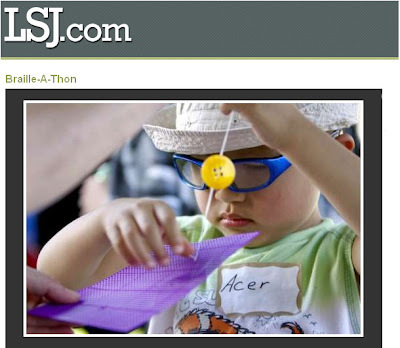 Pictured above, Acer is sewing on a button at Braille-A-Thon at the State Capitol in Michigan. Threading the needle was no issue for young Acer. At events like these, the Bowman-Tomlinson siblings, both blind, "meet true peers... and people who may turn out to be mentors," says Heather. "They learn they are not alone. This is even a bit more important than working on their adoption or Chinese Culture, as there are far more people who are adopted or who are Chinese. Finding things to help them understand that part of their lives, the blindness part, is much harder." Thanks so much for sharing, Heather! Young Nate is practicing his skills, in Arizona, too! "We adopted our son Nate, from China, through Children's Hope in 2007. He is now 3-1/2 yrs old and just got his photo in one of our local newspapers! 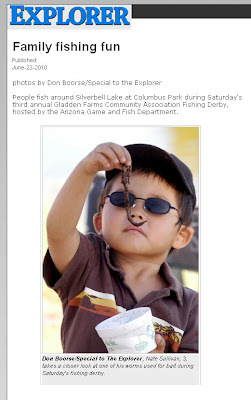 We attended Family Fishing Day in our city and while we were enjoying the event, a photographer snapped a photo of our son," says parents Don and Denise Sullivan. Check out Nate's picture in the Arizona Explorer by clicking the photo link at left.